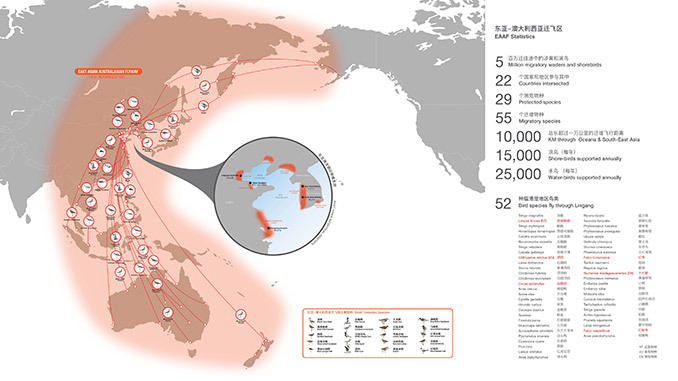 Each year more than 50 Million birds make the return journey from the Antarctic reaches to the northern tip of the earth along the East Asian-Australian Flyway (EAAF) seeking food and shelter. 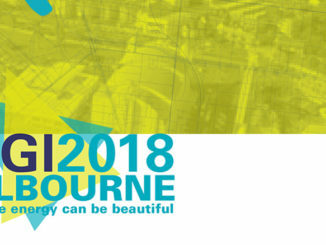 1 of 8 global north-south fly ways, the East Asian-Australian corridor is now the world’s most threatened due to loss of bird foraging habitat by coastal urbanisation. 1 in 5 globally threatened waterbirds including the Black-Tailed Godwit fly the EAAF but they are suffering rapid declines in population. 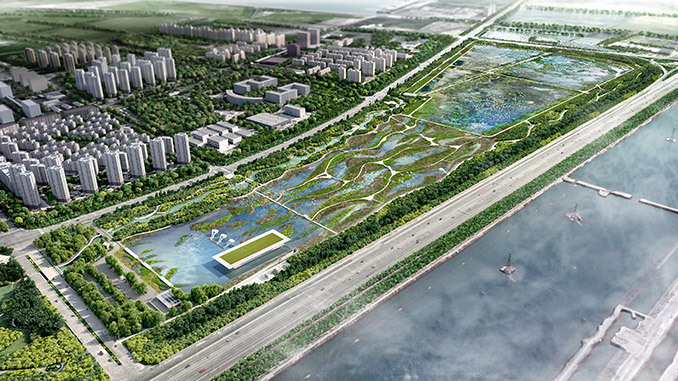 In a bid to increase critical bird habitat on the shores of the Yellow Sea in China, the Asian Development Bank encouraged the Port of Tianjin to embark upon an international design competition for a wetland bird sanctuary on a degraded land fill site in the Lingang area. 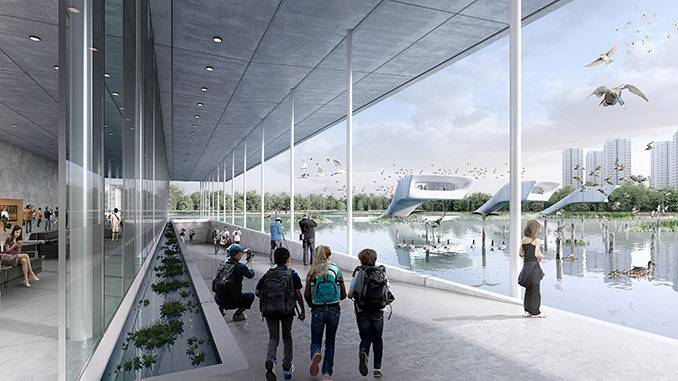 McGregor Coxall have been awarded first prize in the competition with a design that proposes the world’s first migratory ‘Bird Airport’. 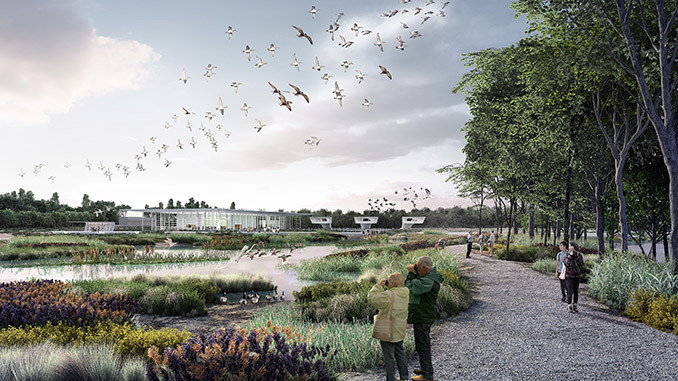 The masterplan recognises the importance of the site both to China, Australia and the earth’s ecosystems by proposing a 60 hectare wetland park and bird sanctuary. With some birds flying non-stop for more than 11,000km and up to 10 days without food or water, the airport will be a crucial re-fueling and breeding stop on the EAAF. 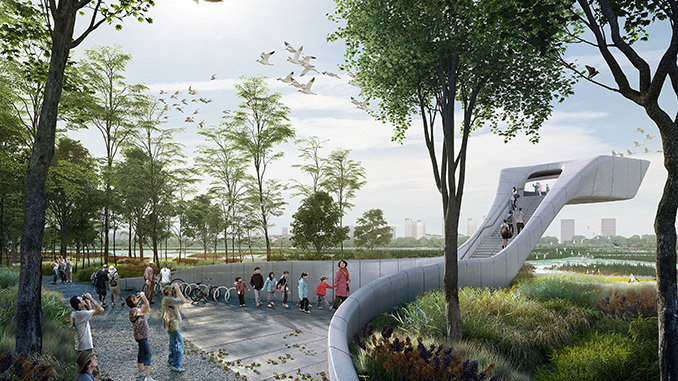 Part of a green necklace of new parkland for the city of Tianjin, the project will deliver green infrastructure including constructed wetlands, parkland and urban forest. 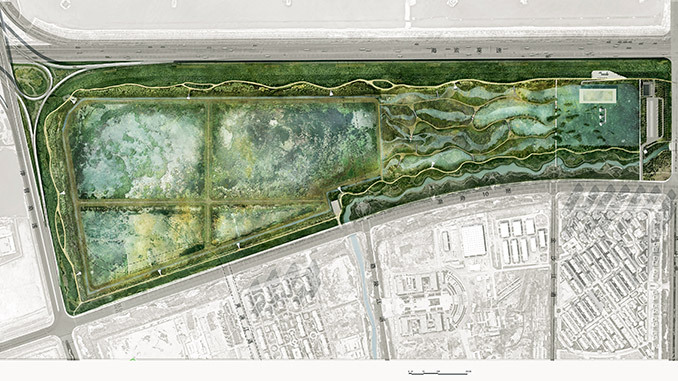 Renewable energy will be used to move recycled waste water and harvested rain water through the wetlands. Public facilities include wetland trails, a lake loop walk, cycle circuit and forest walk making up a 7km recreational nature trail network. The project will amplify China’s growing role as a hot spot for international migratory bird research and function as a pilot project in the national Sponge City program. 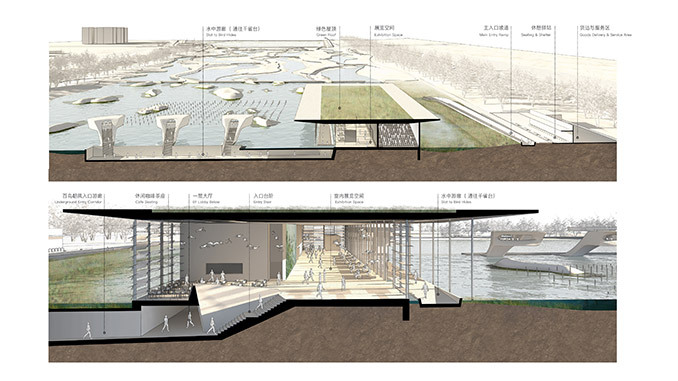 Catering for an anticipated visitation of 500,000 people per year, a high-tech visitor education and research centre called the Water Pavilion is proposed. The centre will be digitally connected to cameras in 14 bird hides for monitoring bird life. The wetlands are surrounded by a 20-hectare fringing forest to protect the birds from intrusion by nearby urban development. The project is expected to begin construction in late 2017 and be completed by 2018.